The names of characters in Mad Max: Fury Road consist of nonsensical (and autocorrect-hating) phrases such as Immortan Joe, Imperator Furiosa and Toast the Knowing. The film takes place in a future society that is both alien to viewers and eerily prescient. The original films centered on the decline of civilization, and it’s tribal battle for resources. 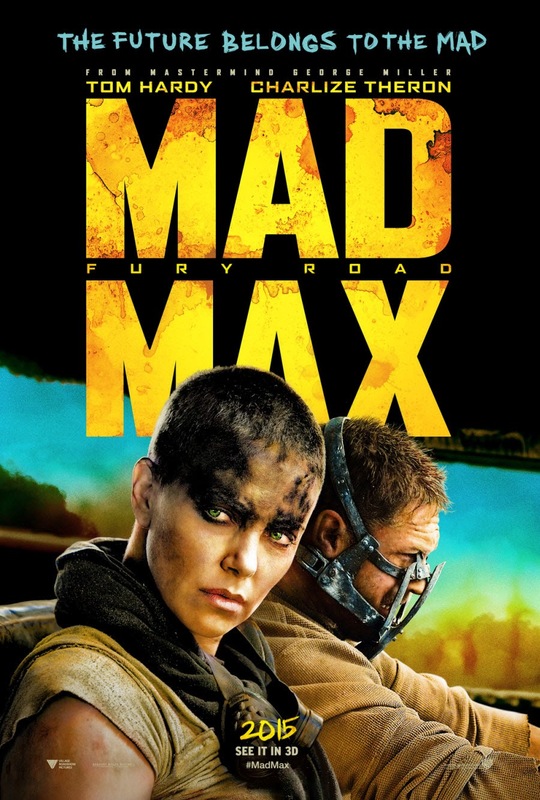 In this entry finds the titular hero fighting alongside top notch driver Furiosa, as they attempt to escape Immortian Joe and his “war boys.” Joe not only has control of water and food in this region, but he also keeps women enslaved for repopulation and the young men ready to die in his territory wars. Basically, this isn’t a world anyone would want to live it, yet seems only a news story away. If they had Twitter in this future wasteland, I’d imagine #FreeOurGirls or #FreeTheWater might be trending. Frightening as this future might be here, it may be impossible to watch the film without jaw dropped or mouth covered. Even so, the story is surprisingly simple. Max, captured by Immortan Joe’s war boys and used as a renewable source of donation for their blood bank. Once Furiosa makes a break from Joe’s stronghold, Max joins her and Joe’s “wives,” as they attempt to escape and find an oasis sanctuary. The entire film is constructed as a non-stop, elaborate chase sequence, and cars tear though an apocalyptic Australian outback, flipping, crashing and exploding the entire way. The “quiet” scenes are just as tense as the loud ones, since Joe’s war party is never far behind Max and Furiosa as they make their way to freedom. Were the bombast of heavy metal and engine’s roaring not so integral to the Mad Max experience, this could have been a silent film. There are even talks of the film being released in black & white on the home video release, further indicating the silent era qualities of the film’s visuals. Fury Road makes several nods to the previous films in the series, though it’s not exactly a direct sequel. No knowledge is required of the Max universe, and the timeline is fluid. The most notable change is the addition of Tom Hardy as Max, taking over from Mel Gibson in the original trilogy of films. The film also recasts Hugh Keays-Byrne, who played as the villain Toecutter in the 1979 original, as Immortan Joe in this entry. None of the films are really mean as literal continuations of each other, which adds to the series’ fable-like qualities. To be frank, it’s a nice change of pace of for a fantasy sequel to be self-contained, rather than requiring audiences to keep track of a dense mythology. Mad Max: Fury Road is a fantastic action film, and will likely one of the top films of the year. Director George Miller elevates what could have been a cash-in sequel to art.